Rinseable and reusable, use wet or dry. 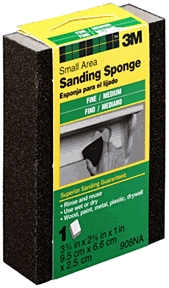 For sanding drywall, wood, paint, metal, and plastic. Flexible for contoured, hard to reach surfaces. Aluminum oxide mineral on all four sides. Two sanding grades on one sponge, medium and coarse.